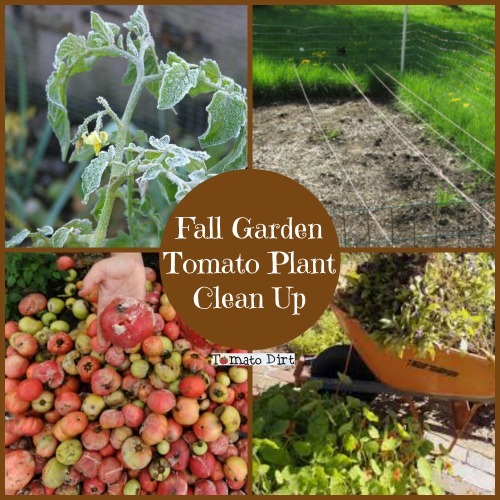 This Tomato Garden Fall Cleaning Checklist (Part 1) makes it simple to put to bed your veggie garden for the winter. You have to face the hard fact: the inevitable (winter) is coming. No matter how diligent you are, your tomato plants are going to stop growing – even if you lengthen your tomato season by protecting tomatoes from frost. But you can get a head start on next season now. 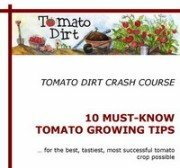 Take just a few simple steps at season’s end and you can save a lot of time in the spring and help ensure a healthier tomato crop next year! You don’t want to cut short your tomato season. Before you yank out plants from your garden, be sure tomatoes are done producing. Be prepared for the end of the season by anticipating when your tomato plants will stop growing. Know the first frost date for your local area. Plan garden clean up into your schedule accordingly. If you’re having a glorious Indian summer, enjoy the ride – and the tomatoes! If you’ve had frost or a freeze, even if early for your area, check your tomato plants for cold damage to know they are finished for the year. Successful gardeners know that one secret to a healthy tomato crop is to rotate crops. Use a stake, post, rock or other marker to notate your tomato plants’ home in the garden this year. It’s best to give yourself this bit of extra insurance rather than trusting your memory, especially if you’ve grown tomatoes for more than one season. By marking your tomato growing spots, you will avoid planting them in the same row or area next year. Dropped, “mummified,” or rotten tomatoes on the ground can breed tomato diseases. Prevent that by collecting them and destroying them. Pull up spent tomato plants, including roots (as well as bean, squash, pea, cucumber, pepper, other vegetable plants, and weeds that surround tomatoes) that are finished producing or have been killed by frost. If they’re disease-free, compost them. If any are diseased, either burn them or discard them separately. It may be tempting to simply till all this year-end garden debris into your garden to break down or add it to your compost pile. But beware. Fungi, bacteria, insects, and larvae that affect tomatoes – including septoria leaf spot, early blight, late blight, fusarium wilt, verticillium wilt, and bacterial wilt – overwinter in the garden. By removing tomato plant debris (rather than composting it, working it into the soil, or leaving it until spring) you reduce build up of diseases and pest infestation. You’d think composting diseased tomato plants is an alternative but to be truthful, it’s not a great idea. Most of the time, interior heat in compost piles does not reach a high enough temperature to kill pathogens. If you compost affected tomato plants or surrounding debris that have been exposed to fungi or bacteria, you risk infecting next season’s tomato plants. Remember that organisms can survive in weeds as well as tomato plants, so any growth surrounding tomato plants should be removed, too – including weeds.